If you're in between sizes and have any tummy flaws, we recommend ordering up as the dress is the most tight in this area. The bust has some tolerance because of the pleats. The fabric is stretchy. 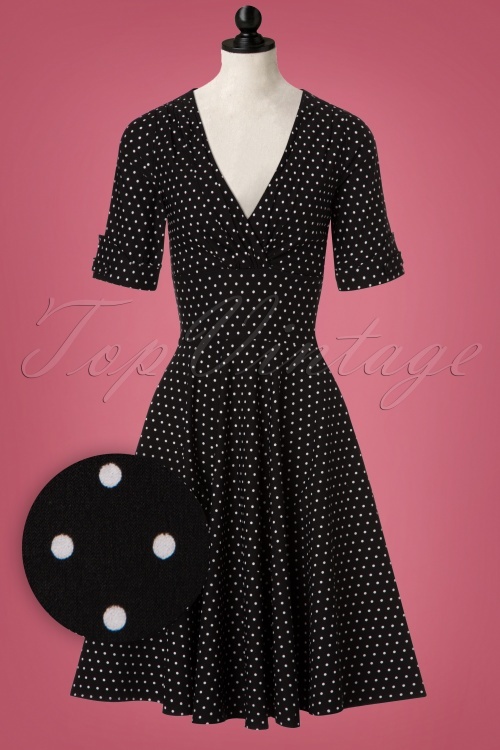 You'll feel like the most beautiful woman when wearing this 50s Delores Polkadots Swing Dress! 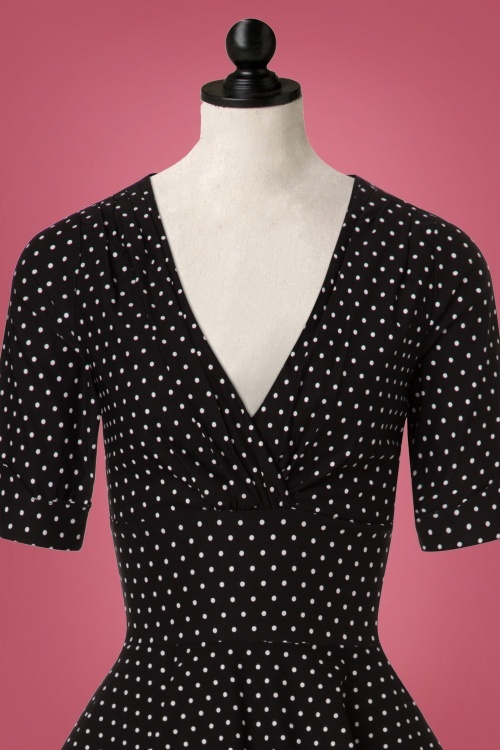 You'll steal the show when wearing this retro stunner ;-) When you make your entrance in this beauty, all eyes will be on your stunning silhouette, the pleated wrap top and the elegant sleeves with darling details. 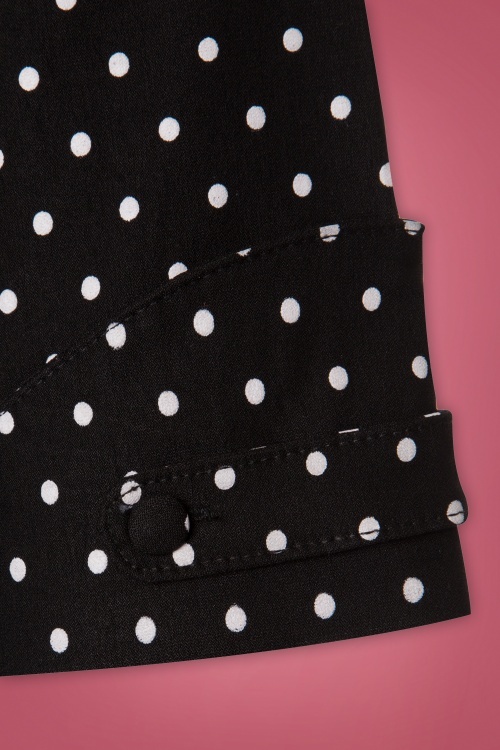 Not only a fairytale to see but also to wear; she's made from a luxurious, stretchy black cotton blend with a playful white polkadot print. 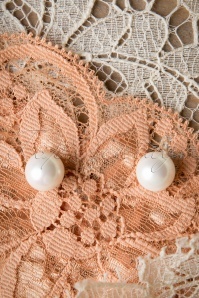 Fabulously classy! Sehr anschmiegsames Kleid mit hohem Tragekomfort. Durch die genaue Größentabelle sitzt das Kleid einfach perfekt. Leider ist der Ausschnitt sehr tief, deswegen geht es kaum ohne ein Top darunter anzuziehen. 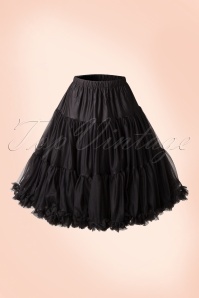 Der Petticoat passt dazu auch super, kann man aber auf jeden Fall auch ohne tragen. Ik heb van deze jurk 2 varianten. De snit is geweldig, mooi afslankend. 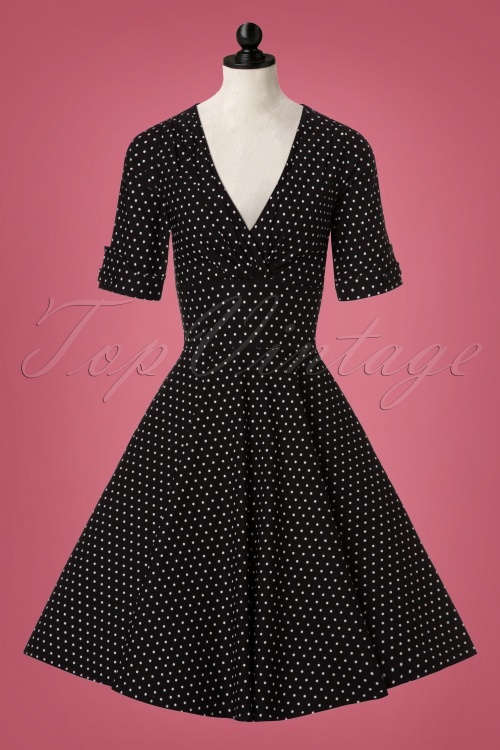 J'ai reçu la robe hier, elle me va comme un gant (j'ai suivi les conseils donnés sur le site)! Le tissu est de qualité, assez lourd (mais c'est un plus! )et légèrement élastique! Je suis ravie de mon choix! 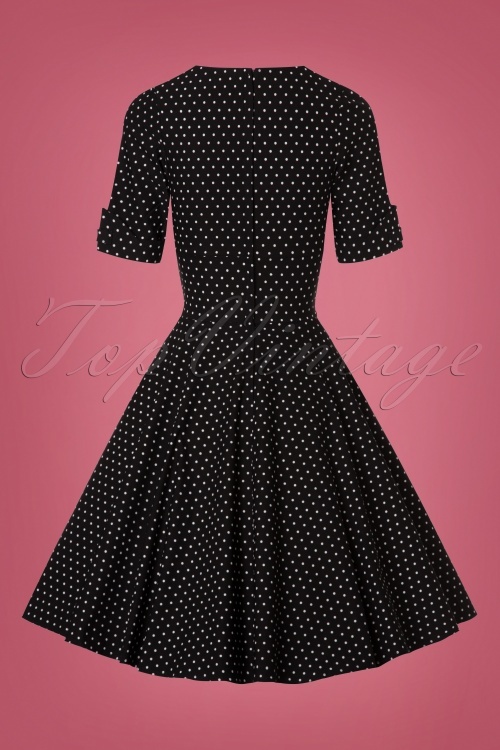 Cette robe élégante et qui met réellement la silhouette en valeur ne va pas rester cachée au fond de ma garde-robe! très belle coupe, fait une très belle silhouette lorsqu'on est ronde. beau tissu je l'adore!! 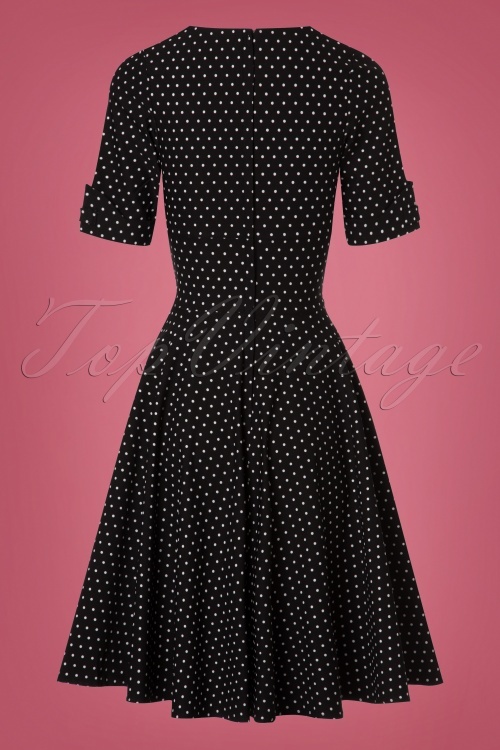 Very comfortable sailor and polka dot dresses - lovely material, super design. I ordered the blue ones one size bigger, as according to Fit Advice my waist measurment fell in the borderline and in that case one´d better order up - in addition my regular size was at that time sold out. It turned out, I could easily fit in my usual size, but I kept them anyway. They´re just amazing. 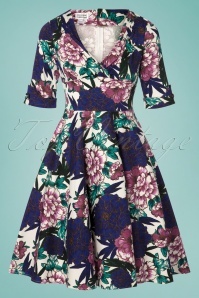 Dieses Kleid ist einfach nur schön! Es sitzt perfekt, passt sich an den Körper an und fällt dennoch sehr schön weit. Der Stoff raschelt etwas, trägt sich aber gut und man schwitzt auch nicht so sehr darin! Absolutes Highlight! Elke keer een plezier om mijn pakket te ontvangen! Topvintage is mijn kledingszaak geworden en past precies bij mijn persoonlijkheid! Zalig weer vrouwelijk te zijn! Das Kleid ist ein Hingucker, ebenso die Schuhe. Der Ausschnitt des Kleides ist sehr groß, geshalb habe ich einen kleinen Knopf aufgenäht. Die Schuhe sind einfach eine Wucht. Sits perfectly and is very flattering! Love it!